Soft soldering is a useful process for joining metals of many types, particularly small intricate parts which might get deformed or damaged with higher temperature processes. 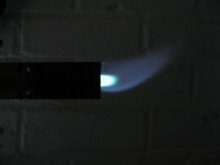 The process described here uses a gas torch as the heat source. Credit for this process needs to go to the contributors of the Gauge 1 Yahoo group who helped me get started in soft soldering. Example of soft soldering. The tender for a gauge 1 locomotive. Even though soft soldering uses a low temperature the joints are very strong if made correctly. It can be used to make containers liquid tight as in the tender shown above which was screwed together and then soldered to seal it. However it should not be used for boilers where the stress and heat can make the joint come undone. The solder used was of the electrical type. 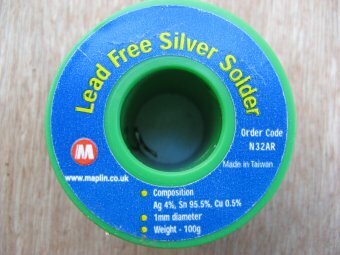 This solder had some silver content rather than just being pure tin. The melting point was approximately 215ºC. To go with the solder some Bakers No3 flux fluid was purchased. 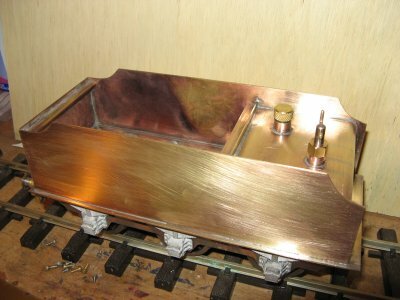 In this example, 2 pieces of brass plate were soldered together to form a right angle. 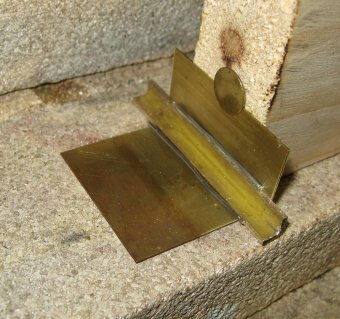 The joint was re-enforced with a piece of brass angle on the inside. First all the mating surfaces were cleaned using some 'Scotchbrite' or a kitchen scourer. Next the parts were assembled with some bakers fluid on the mating surfaces. 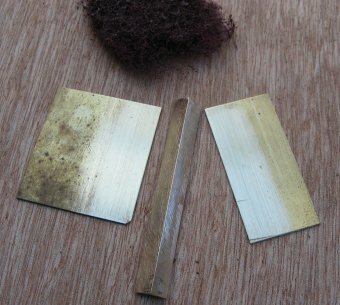 In this example the upright piece of brass was supported by a piece of wood and a drawing pin. 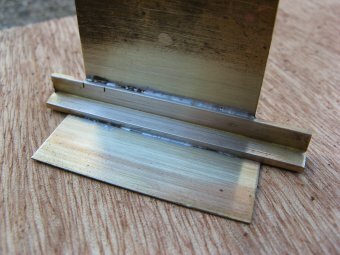 The low temperature of soft soldering makes it possible to use wood to hold part positions. Next some lengths of solder were cut and placed along side the joint and then some more flux was added over the solder with a lolly stick. Finally the parts were heated using a gas torch on a very low flame. 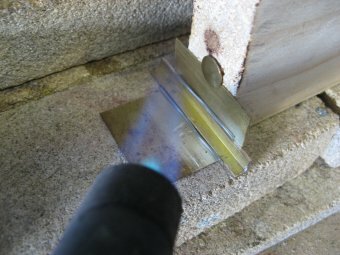 The images below were taken to show how the flame was turned down to avoid melting the solder before the work was hot enough. The gentle heat was focused on the parts to be joined rather than the solder itself. The solder was left to melt via conduction. Soft soldering flame with heat minimised. 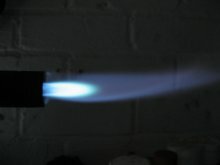 Comparison of heating flame settings. Here is the finished joint after cooling and cleaning. Quenching could be used to cool thicker parts, but it should be avoided on thinner parts which may distort. Cleaning is important if 'Bakers' fluid is used, as it can start to corrode the metal if left untouched. Cleaning can be done with the Scotchbrite or a fine wire brush.